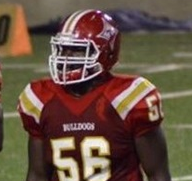 Kennesaw State Football has offered OL Javonte McGriff (2019) of Thomasville HS. Recruit Georgia: McGriff plays with a wide base and light feet. His pass blocking is really good for a 2019 recruit, he has really active hands – plays with good leverage. Overall, he is a really good athlete, who should end up around 285-290 at the next level. McGriff has a really good body composition, and this next offseason a nice increase to each lift should really add that extra explosion to his film. Top quality recruit, and his grades should help attract a wide variety of FBS/FCS colleges. If he can slide over to center that could really boast his chances with FBS colleges too.